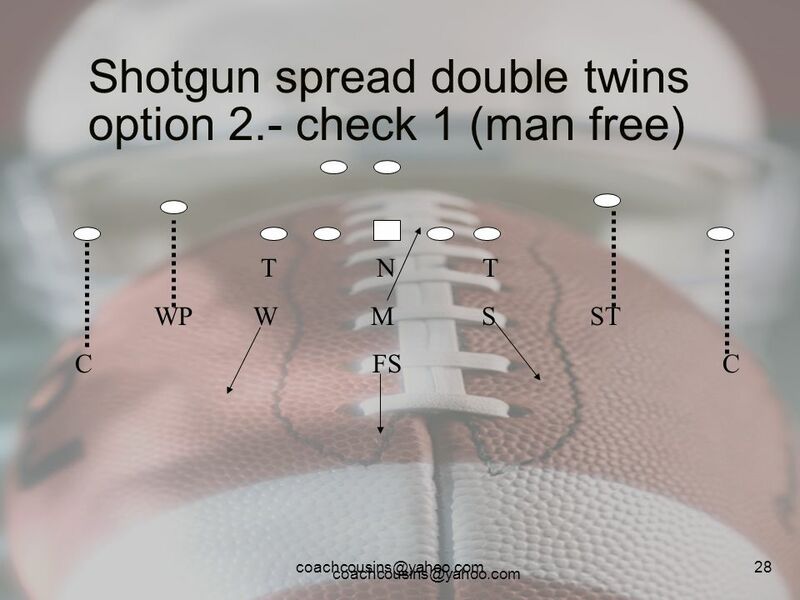 2 What teams running the spread try to do. Get us to remove linebackers from the box and lose gap integrity. 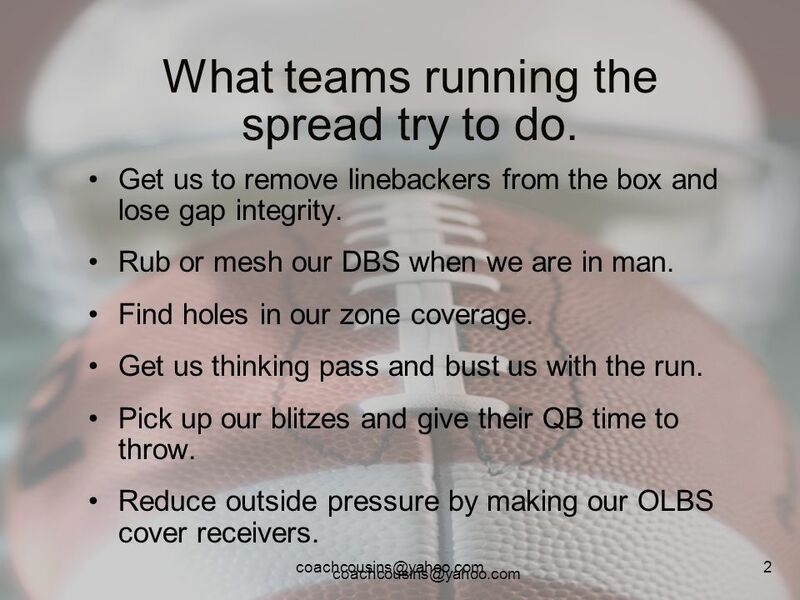 Rub or mesh our DBS when we are in man. 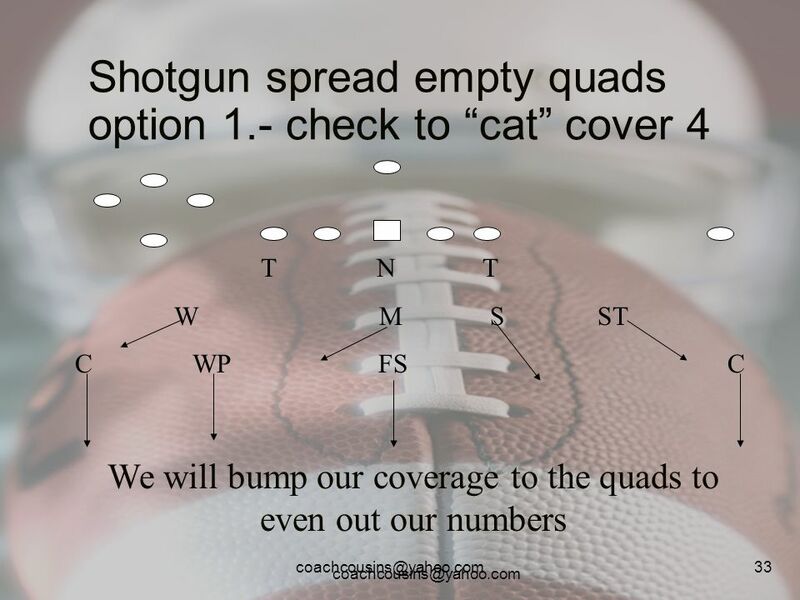 Find holes in our zone coverage. 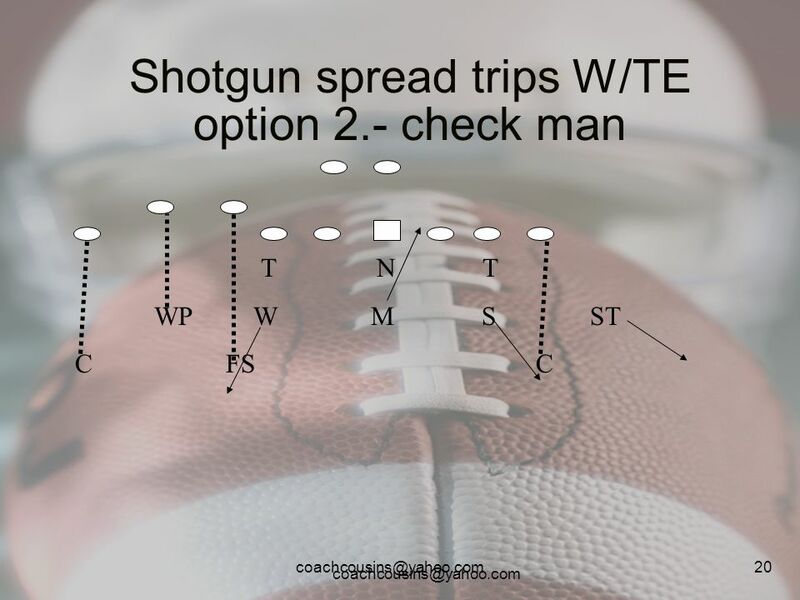 Get us thinking pass and bust us with the run. Pick up our blitzes and give their QB time to throw. 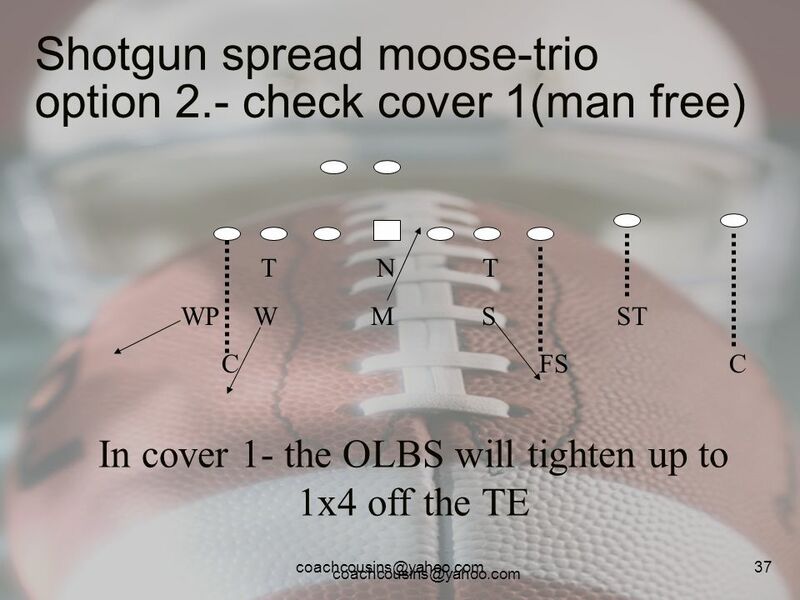 Reduce outside pressure by making our OLBS cover receivers. 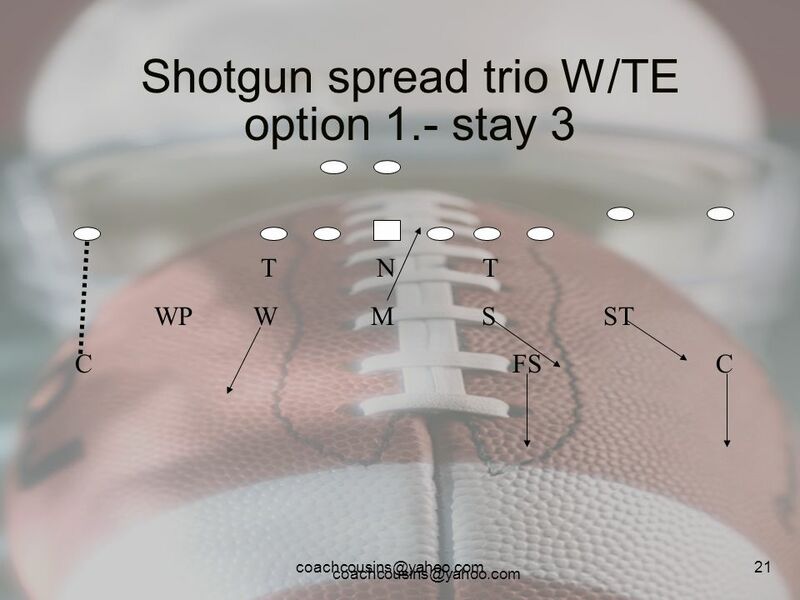 3 What we try to do to teams running the spread. 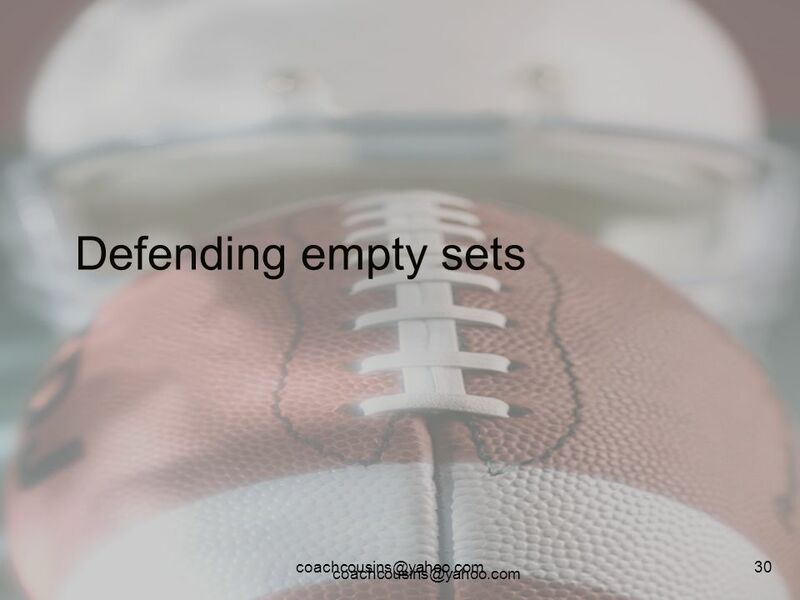 Force the QB to throw under distress. Maintain gap integrity. 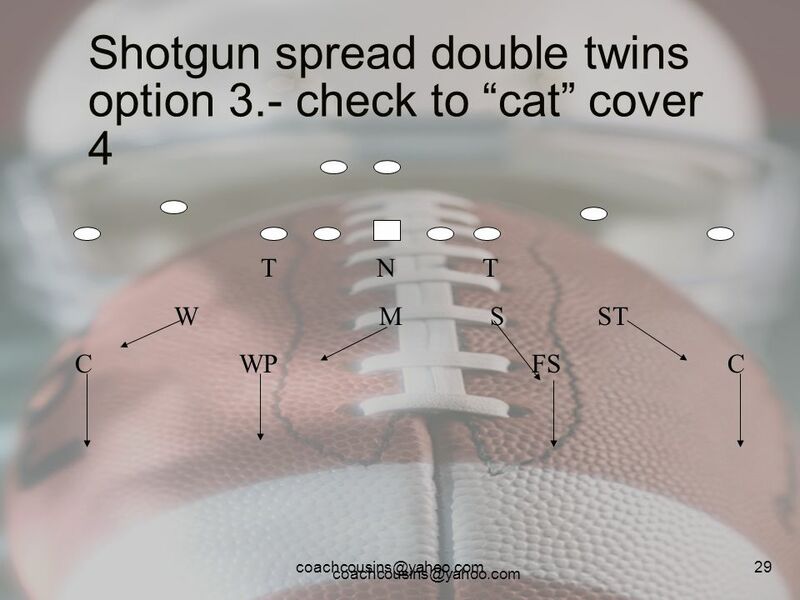 Confuse the QB by disguising and changing coverages. Force the QB to try and find the holes in our zone coverage. Shut down the run by maintaining gap integrity, and in turn making the offense one dimensional. 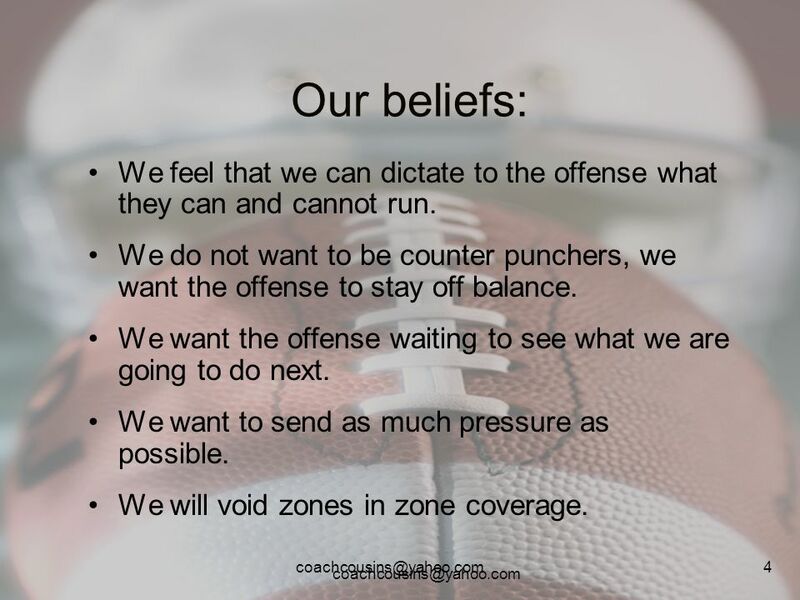 4 Our beliefs: We feel that we can dictate to the offense what they can and cannot run. 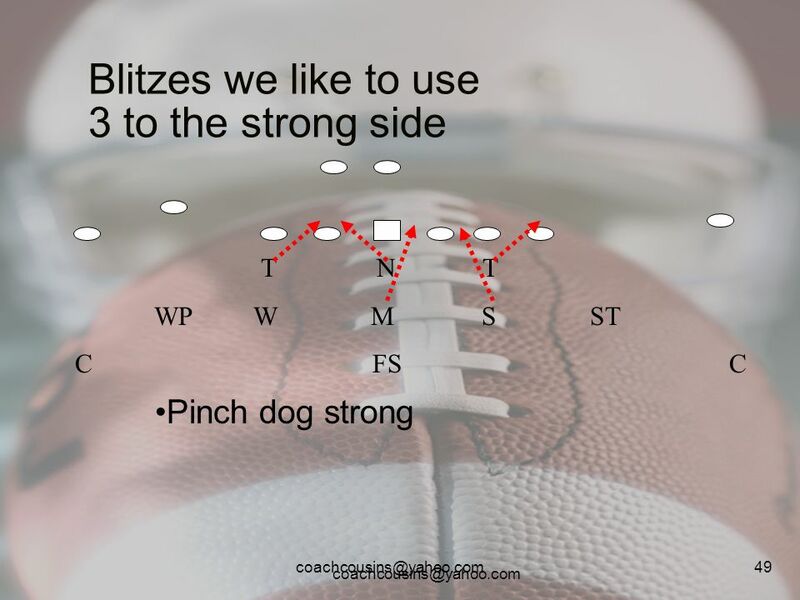 We do not want to be counter punchers, we want the offense to stay off balance. We want the offense waiting to see what we are going to do next. We want to send as much pressure as possible. We will void zones in zone coverage. 10 Cover 3 (sky) T N T WP W M S ST C FS C “Sky” tell us that we are going to show cover three and on the snap roll to cover 4 (quarters) Free safety will slide to the strong hash Whip will sprint to the weak hash. 11 Cover 4 (Quarters) T N T W M S ST C WP FS C In cover 4 Mike will not rush, he will settle in the middle of the field. Whip will move back as a true safety. Will will play weak hook/ curl to flats. 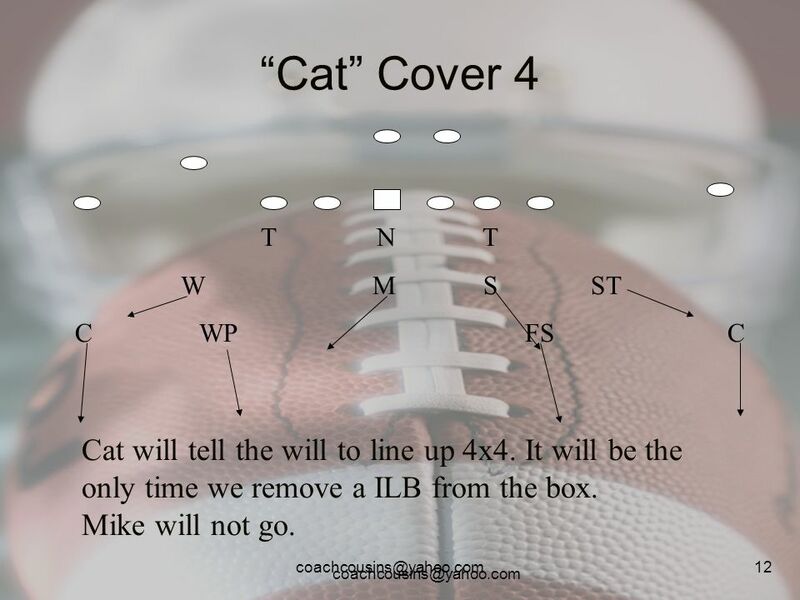 12 “Cat” Cover 4 T N T W M S ST C WP FS C Cat will tell the will to line up 4x4. 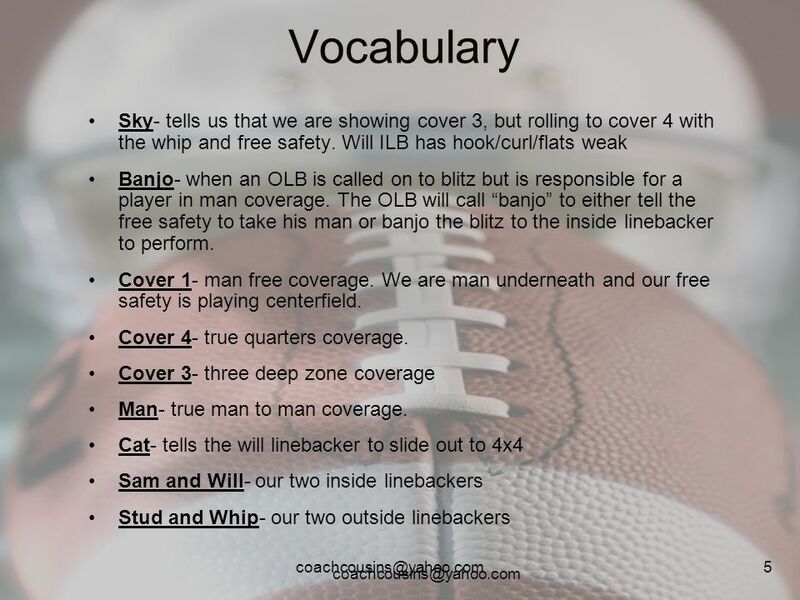 It will be the only time we remove a ILB from the box. Mike will not go. 13 Formation adjustments against the spread. 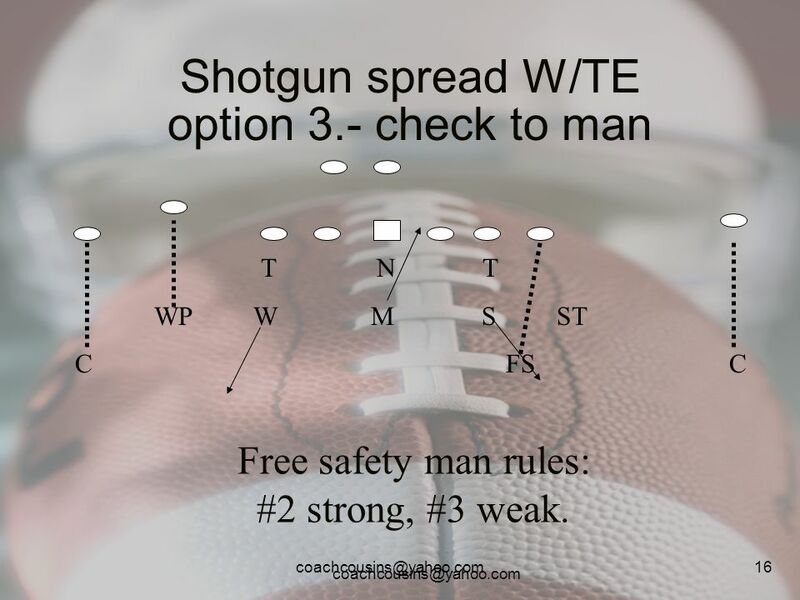 T N T WP W M S ST C FS C Free safety man rules: #2 strong, #3 weak. 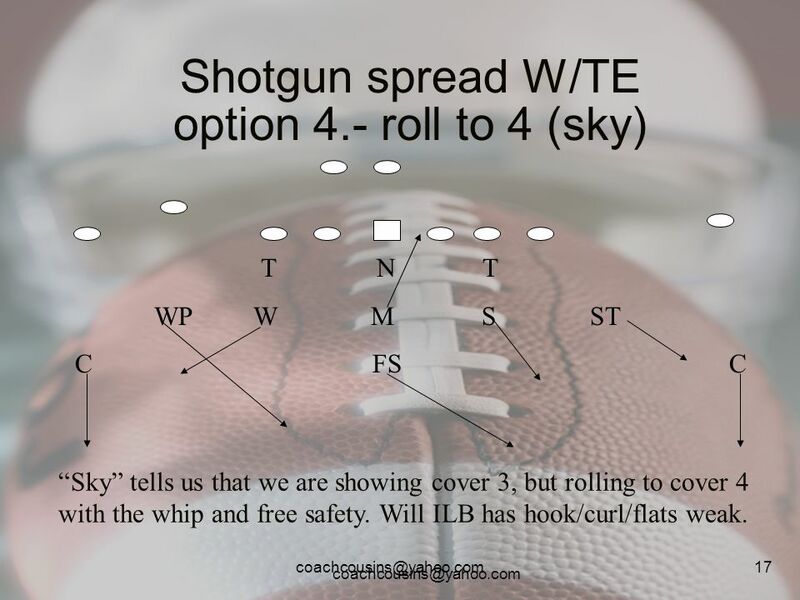 T N T WP W M S ST C FS C “Sky” tells us that we are showing cover 3, but rolling to cover 4 with the whip and free safety. 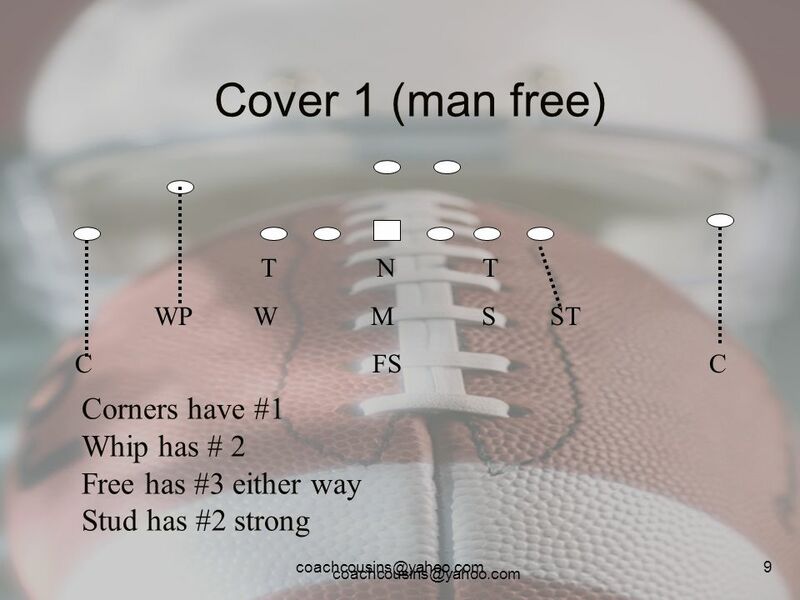 Will ILB has hook/curl/flats weak. 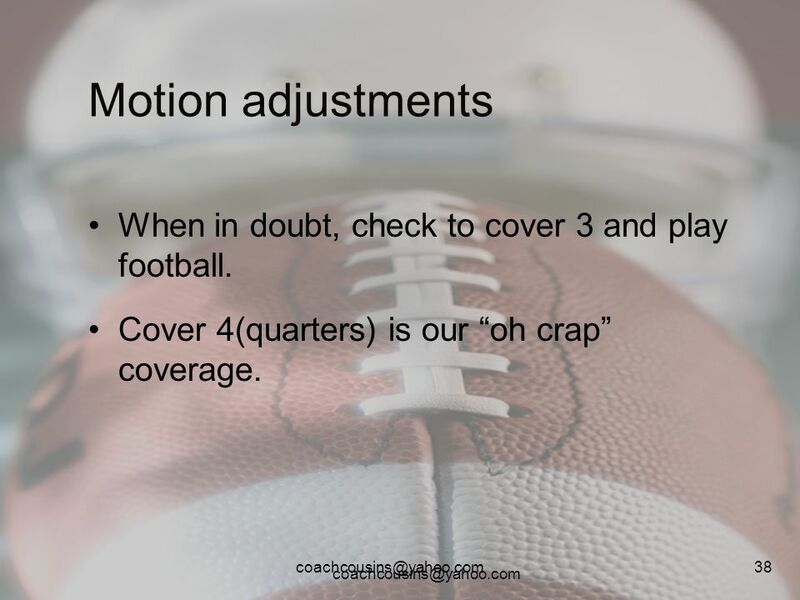 38 Motion adjustments When in doubt, check to cover 3 and play football. Cover 4(quarters) is our “oh crap” coverage. Will- Read- scoop/flow away- Fit- backside a gap Mike- Read- base/double team- flow strong- Fit under chip by tackle if possible- playside a gap Sam- Read- base/ double team- flow inside- Fit- step to outside of double team- refit under because of flow. 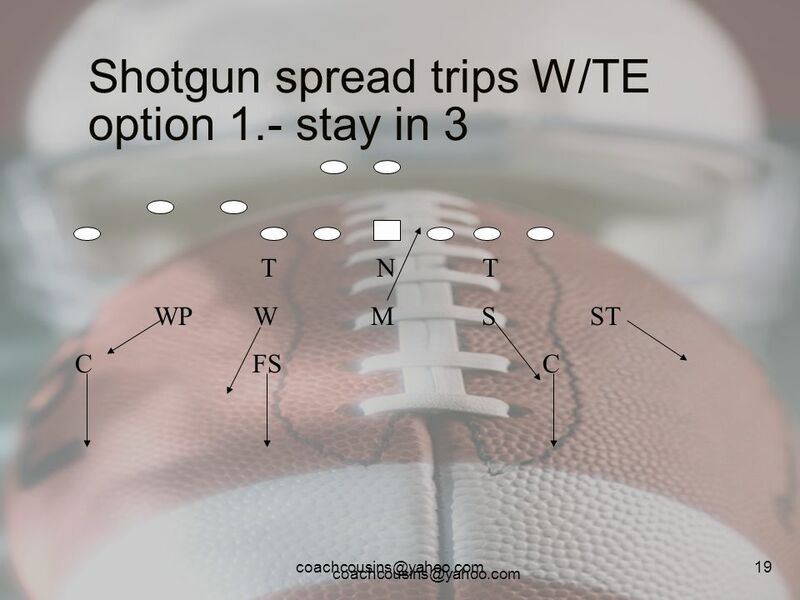 Stud- Read- down- flow to- Fit- run feet of TE d gap. 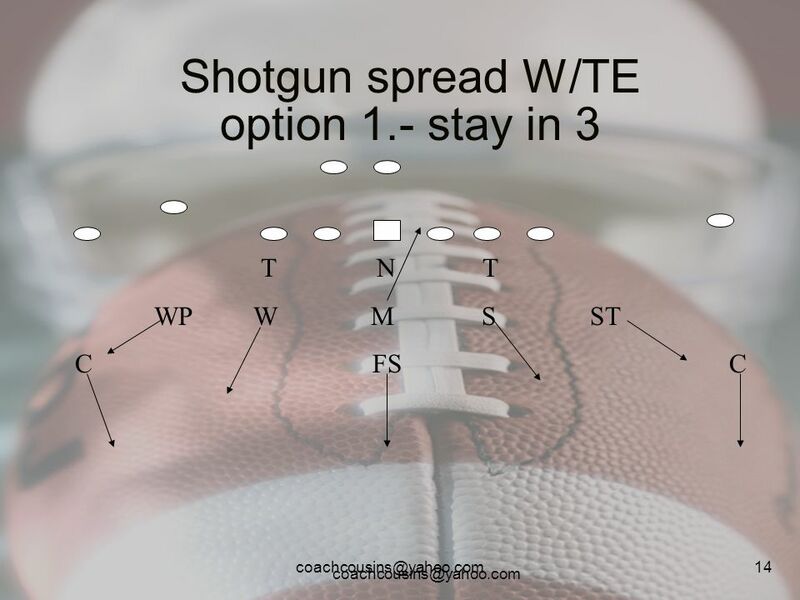 Force play inside. Whip- Read- scoop- flow away- Fit- hold and fold. Will- Read- scoop/flow away- Fit- backside a gap Mike- Read- reach- flow strong- Fit- under pulling guard playside b gap - Sam- Reach- flow outside- Fit- playside c gap- under pulling guard- down by TE. Stud- Read- fan- flow to- Fit- beat te up the field . Force play inside. 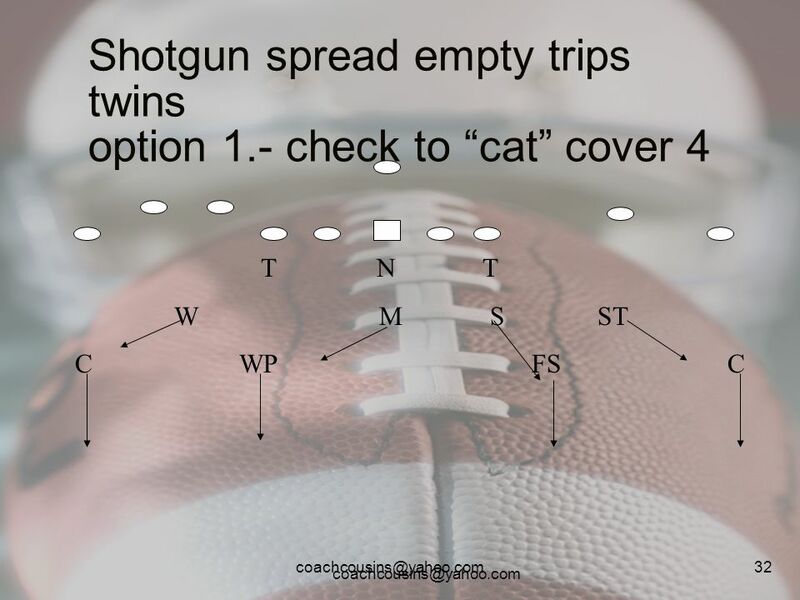 Whip- Read- scoop- flow away- Fit- hold and fold. Will- Read- scoop/flow away- Fit- backside a gap Mike- Read- base/double team- flow strong- Fit under chip by tackle if possible- playside b gap Sam- Read- down- flow inside- Fit- rip under down block by TE- Stud- Read- down- flow to- Fit- run feet of TE d gap. Force play inside. Whip- Read- scoop- flow away- Fit- hold and fold. 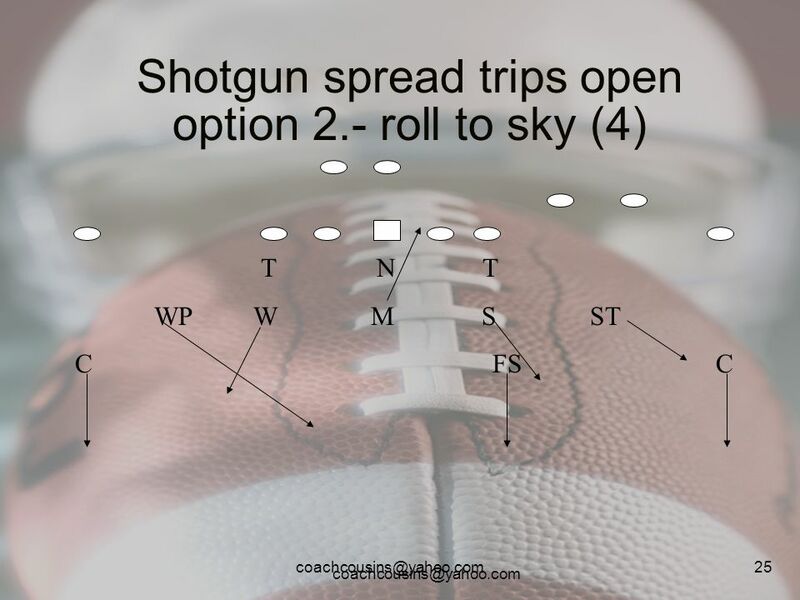 Will- Read- scoop/flow away- Fit- backside a gap Mike- Read- base/double team- flow strong- Fit under chip by tackle if possible- playside b gap Sam- Read- fan- flow inside- Fit- fill open window now. 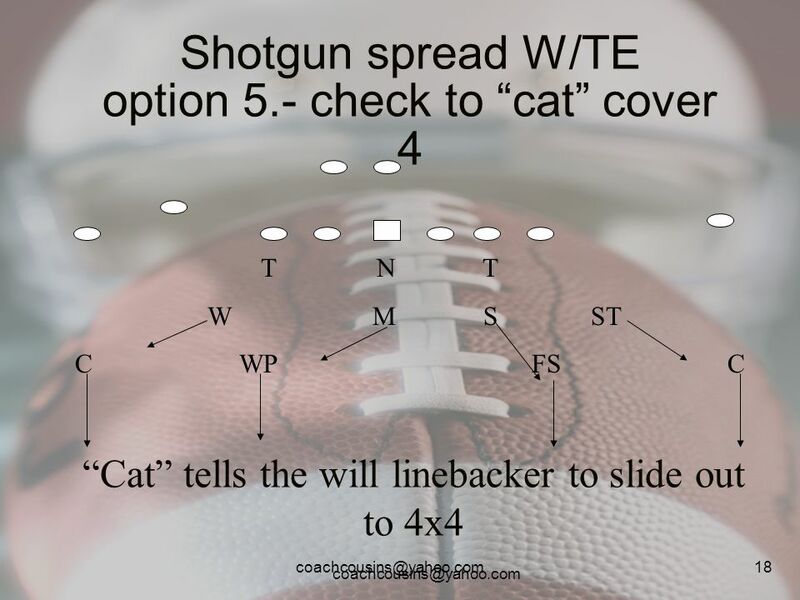 Take on fullback with outside arm and make ball bounce Stud- Read- fan- flow to- Fit- beat TE upfield. 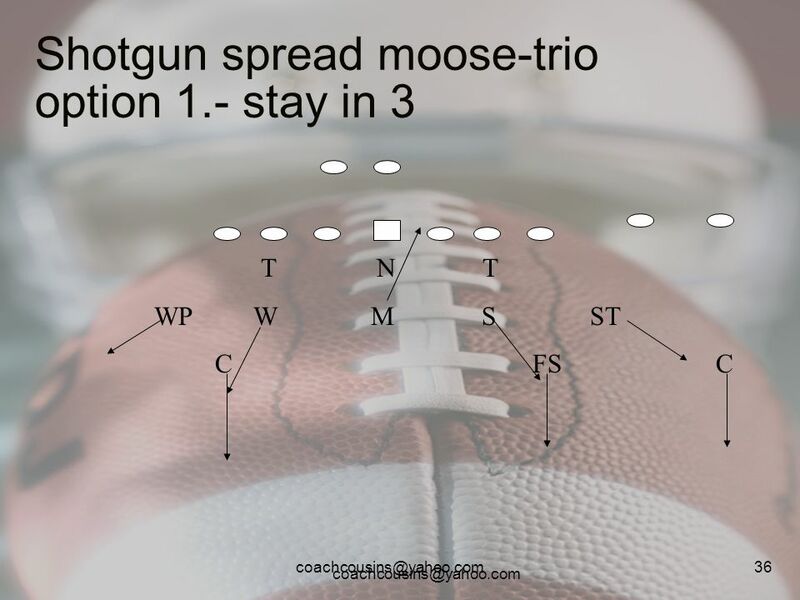 Force play inside. Whip- Read- scoop- flow away- Fit- hold and fold. 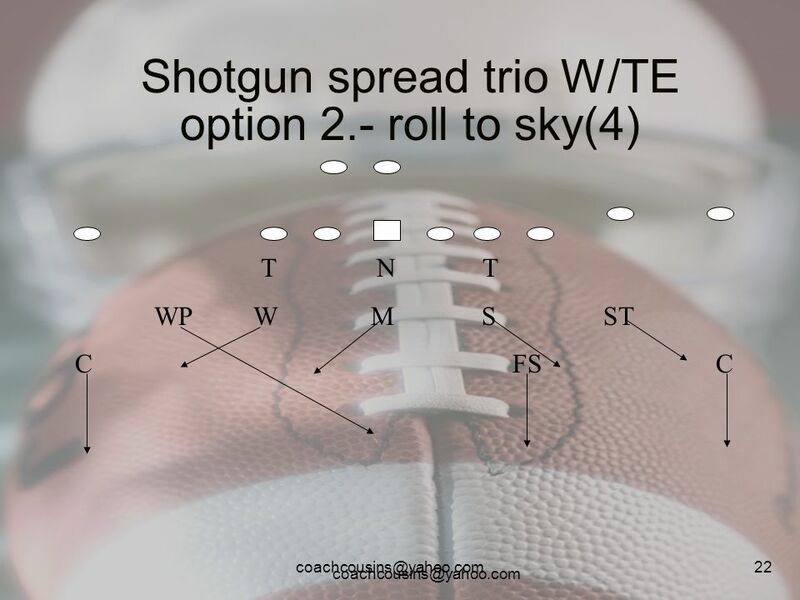 Will- Read- scoop/flow away- Fit- backside a gap Mike- Read- base/double team- flow strong- Fit under chip by tackle if possible- playside b gap Sam- Read- base/ double team- flow outside- Fit- rip under chip by tackle-playside c gap Stud- Read- down- flow to- Fit- run feet of TE d gap. Force play inside. Whip- Read- scoop- flow away- Fit- hold and fold. 53 Closing We work very hard on not getting outflanked by formations. 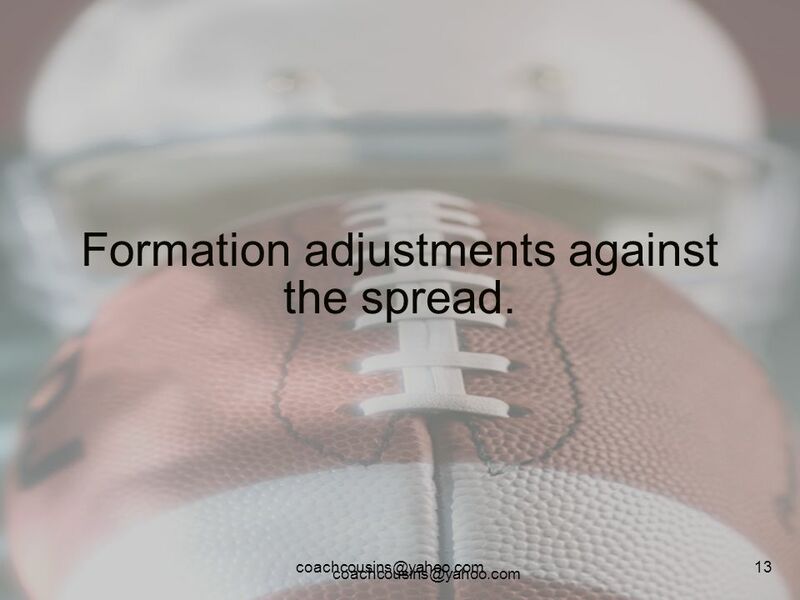 We work formation adjustments, motion adjustment, and checks everyday. 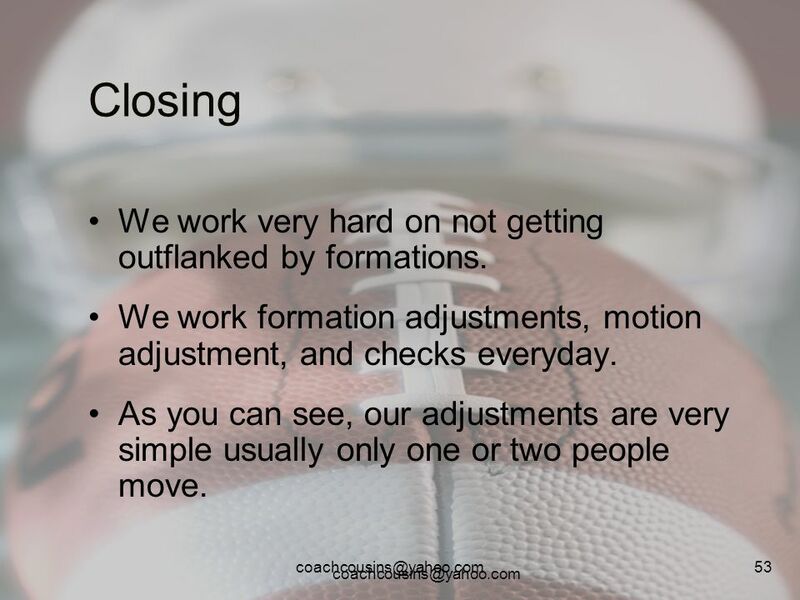 As you can see, our adjustments are very simple usually only one or two people move. 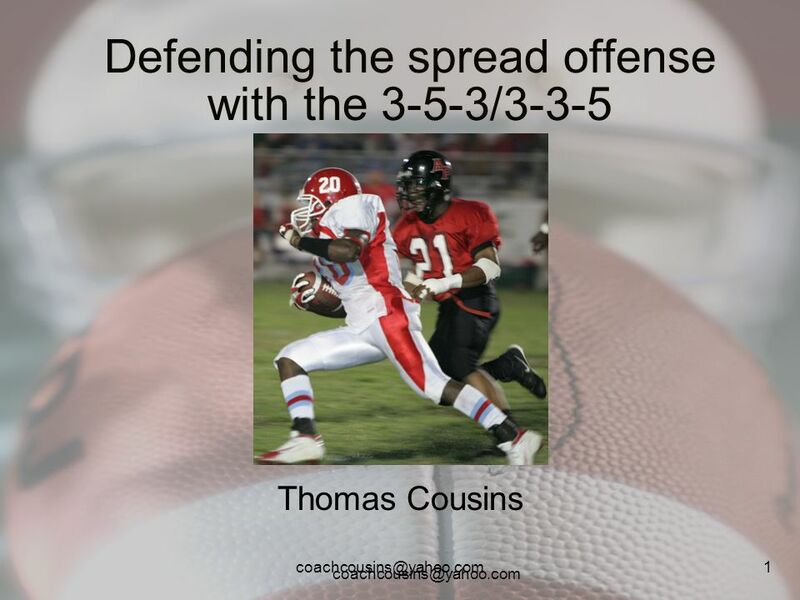 Download ppt "Defending the spread offense with the 3-5-3/3-3-5"